A powerful and uplifting production, rich in warmth and humanity. There are no spoilers here as Margaret Edson’s fin de siècle drama about the final hours of Dr Vivian Bearing’s life, first performed in 1997, is well documented and much acclaimed. Even the Exchange’s publicity posters quote the central character’s early line “I don’t wish to give away the plot, but I think I die at the end”. An overheard snippet of conversation in the Theatre foyer pre-show made me smile: “What a lovely end to a romantic day – a play about death!” From their tone it was clear the speaker was aware that, while impending death is present throughout the play’s unbroken 100 minute span, it is more like a character in its own right, and the key ingredient in the text is the titular Wit of the ill-fated professor. Having spent much of her professional life teaching metaphysical poetry to students (in particular that of John Donne) Vivian Bearing finds herself not only a subject of study for the hospital staff, working on an experimental treatment, but a matter of considerable interest to herself. As her life ebbs away she reflects back on formative events and people from her life including her father and an English professor, Dr Ashford, a former mentor and the only friend who comes to visit her in the hospital. Through extracts of Donne and her own musings, Bearing finds her bearings and her identity as she seeks mechanisms for coping with the inevitable and the pain that she must endure. Director Raz Shaw has personal knowledge of stage 4 cancer, a precipice that he has looked over and managed to return from, leading to much work helping others deal with the experience. This history clearly illuminates his approach to Edson’s Pulitzer Prize-winning text and gives the production an air of authentic emotion. 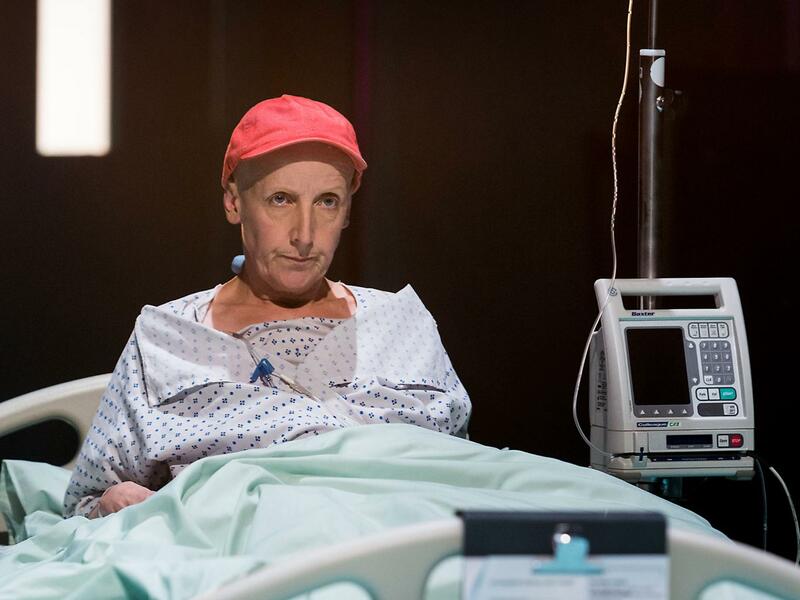 Julie Hesmondhalgh also famously brings experience, in her case of playing a character battling terminal cancer in her former role in Coronation Street, but this is no type-casting as the roles are poles apart. Hesmondhalgh occupies Bearing’s character with tremendous authority and delivers a hypnotic performance that grips the audience throughout from the narrative opening, through episodes of wit, sarcasm and indignity, to her final incandescent apotheosis. Here she doesn’t so much walk into the light, as the text suggests, but almost appears to become the light itself. Vivian’s frustration, both with her own coping strategies and with the insensitivity of the doctors, is painfully apparent but Raz Shaw balances the text’s intrinsic dark humour and the bleak subject matter well. The clumsiness of some of the medical staff is clear from the writing and well conveyed in Tom Hodgkins’ Harvey Kelekian and Esh Aladi’s blundering Jason Posner, the latter just getting away with his portrayal of a doctor who is almost unbelievably crass and insensitive. Other strong performances among a good cast come from Jenny Platt as Nurse Susie Monahan, Vivian’s ally in her hour of need, and Julie Legrand as her friend and confidant Dr Ashford. Hannah Clark has kept the stage design simple and clinical using an open stage and a slow revolve, to ensure that sight lines are unimpaired throughout the house and to give us a gradually shifting perspective in some of the more extended scenes. Lighting by Jack Knowles is brilliantly conceived to both shift the mood and to create the striking image of the closing scene. Despite its apparent bleak subject matter, Wit is rich in warmth and humanity and somehow leaves us with a great sense of upliftment. Wit runs at Manchester Royal Exchange until Saturday 13th February.